I had an interesting experience yesterday. For the past 10 or so years, at some point in the year, I try to ride my age in miles on my bike. In the past, I tried to do the ride around my birthday in March. On occasion, logistics or weather caused me to shift to later in the spring or summer. As I recollect, last year, I did not do the ride at all. I have this thing about biking – I really enjoy riding a lot. A typical road bike ride for me is somewhere between 20 – 25 miles. When I mountain bike on single lane tracks in the woods along the river, there is a 12-mile loop I follow. For the past year, I have had an conflicted relationship with the riding. I put on some 45 or so pounds from compulsive overeating in the past eighteen months. I refuse to ride as a form of exercise if I am going to continue overeating. I have enough understanding not to want to get into an exercise bulimia routine. I ride for pleasure and a form of exercise, but not to allow me to overeat. As my food has gotten a lot better in the last month, I have also gotten back into riding on a more regular basis. I am not riding now just so I can binge on food. 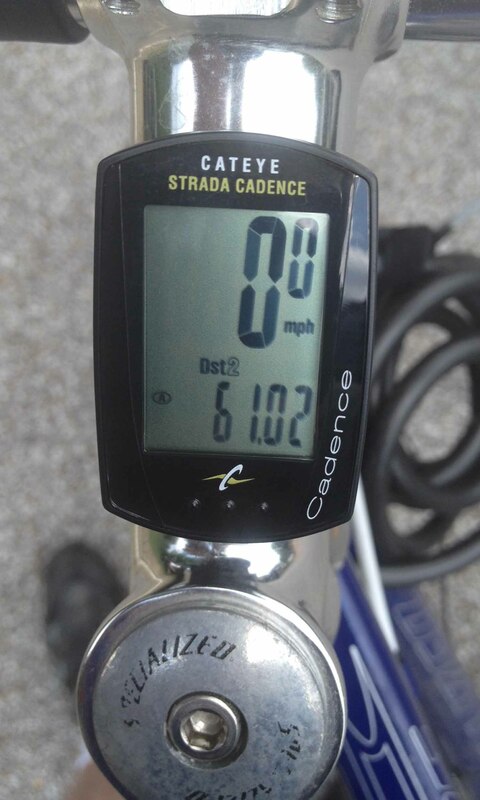 Because I was off of work on the 4th for the holiday, it seemed a good day to ride my age – 61 years/miles. I planned to get up early in morning and head out by 6:00 AM. I ended up not getting on the road until 8:00 AM. I was quite doubtful if I was really up for the challenge. I thought about how in the past, I really stretched on the last few miles to make it. In fact, only one other time in my life have I ridden over 60 miles in a single trip – a cancer fundraising century ride some 10 years that I rode in honor of my granddaughter with leukemia. Yesterday, the first ten miles seemed rough and I was less certain I was going to complete the ride. I began to rationalize, or perhaps more correctly, understand that it was not worth me killing myself for the sake of hitting some magical number. By the time I hit 20 miles, I was feeling a bit more confident. By the time I hit 30 miles, I realized I felt just fine and likely was going to make the entire ride. At 40 miles, feeling good and knowing I only had a typical bike 20 mile ride to go, I felt confident I would make the goal, and I did. I was surprised that at the end of the ride, I was a bit tired, but I really felt quite good. I commented to my wife that I had never felt so refreshed after completing my birthday anniversary ride. So what was so different this year? Today I am in a good place with my recovery. Yes, I have dropped some weight in the last month, but even more, I am dealing with my eating disorder and remain active in my alcohol recovery as well. I took it easy on this ride. I found that being very aware of hydrating, eating the GU gel packets as recommended, stopping for a bagel and coffee break at 40 miles, I was not trying to bull my way through, but mindful and intentional of the riding process. I listened to 5 Overeaters Anonymous speaker leads (Light a Candle Group, podcasts from Los Angeles). I enjoyed listening to the leads with the time to digest the content, think about the words and their applicability to my recovery before moving on to the next lead. Typically, I listen to leads on my way to work where I am also half enmeshed in my tasks for the day. Today, I had nearly six hours of time from when I left the house till I got back some 61 miles later. By riding and taking my tools of recovery into the process, I was able to reach my goal easier than ever before – even though I am 10 years older and carrying a good bit more weight than I did 5 or 6 years ago. I am looking forward to next year when my physical condition will be more in line with my mental and spiritual condition of today.